Blessed by a lovely day after heavy rain we were finally able to carry out our Sports on Saturday 20th. The Kindergarten Sports were held last Saturday after having been postponed due to the weather. 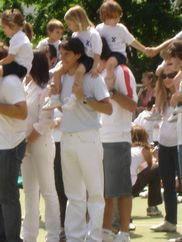 Children enjoyed running the races organized by their Gym Master Guillermo and by their teachers. 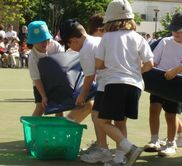 There were balloons, fishermen, cars, aeroplanes, supermarket carts, slippery beanbags and tennis rackets in the races. At the end of the event we had family races, were the children were able to participate together with their family, some on stilts, others blindfolded, others rolling tyres, jumping in hoops, carrying the children on mats, piggy-back and leading with leashes. Throughout the morning everybody kept the kindergarten sports motto alive: Let our children experience the fun of participating and not the pressure of winning. The beautiful morning ended with a picnic for all in the Kindergarten playground. Families together enjoying the spirit of our sports! Let's get our nets ready!